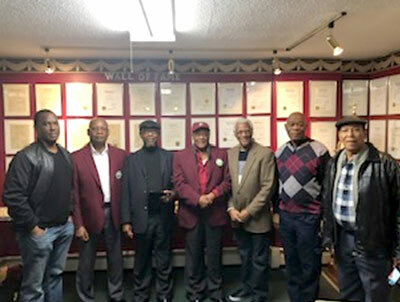 Saturday, January 26, 2019, will be a day always to be remembered by the seven Hall of Famers from New York City, who paid a visit to the Cricket Hall of Fame’s Shrine, which is located in Hartford, Connecticut, USA. They arrived at the Shrine about 1:30 p.m. and was greeted by the Executive Director of the Hall, Michael Chambers and other Hartford Hall of Fame Committee members. Hall of Famers from left are Cliff Roye, John Mitchell, Mascelles Bailey, Lloyd Dixon, John Melbourne, Charles Simpson and Hugh Pitter. Each Hall of Famer was shown his plaque hanging on the wall at the Hall. For Cliff Roye, John Mitchell, Charles Simpson and John Melbourne, it was their very first visit to the Hall. Before the meeting got started, the group watched Cricket West Indies’ (CWI) team humiliate England in the first test of the current series which was being played at Kensington Oval in Barbados. This made the evening that more special. The group, members of the New York Cricket Hall of Fame Planning Committee, was in Hartford to meet with the Hall of Fame Committee to review the events from the 37th Annual Induction Ceremony which was held at the Hilton Hotel, JFK Airport, Jamaica, New York, on October 6, 2018. Approximately 300 supporters attended the program. The class of 2018 were John Mitchell, John Melbourne, Trevor Walke, Curtis Clarke, Fitzroy Hayles, Rudy Persaud, Byron Chambers, Leonard Chambers, Richard Staple, CWI President Dave Cameron, Jimmy Adams and Councilman Allan Maisel. Dennis Hawthorne and Bishop Cecil Riley received Presidential Awards. Special guest was University of West Indies Vice-Chancellor Sir Hilary Beckles who was inducted into the Hall in 2017. He was there to receive his ring. Cameron delivered the main address at the 2018 Ceremony. The reason for the visit to Hartford of the group was to review the 2018 ceremony and make plans for the upcoming 2019 ceremony. Mascelles Bailey was selected as the Chairperson for the 2019 New York Hall of Fame Planning Committee which was charged with the responsibility of selecting four individuals from New York to be recommended for induction. It was decided that the ceremony would be held again in New York on Saturday, October 5, 2019. The President of the Hall, Shirley Matthews, welcomed the group and thanked them for the extraordinary effort that resulted in a very successful 2018 Ceremony. John Mitchell, a Dominican now living in New York, made the most profound statement of the evening. Sitting across from a picture of the great Sir Garfield Sobers, which hangs on the wall at the Hall; John said he was overwhelmed to know that he was now a member of the same organization as Sir Garfield. The evening ended with a delicious West Indian style meal of goat head soup, fish, curried goat, brown stew chicken and ox tail at the famous Dunn’s River Restaurant in Hartford. The meeting was sponsored by the law firm of Attorney Michael Chambers Jr.